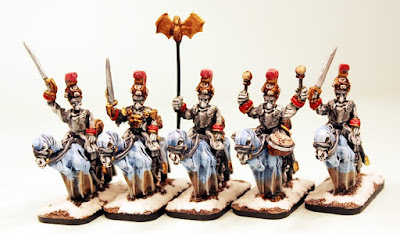 Alternative Armies: Spektrov Cuirassiers for Flintloque take to the frozen field! 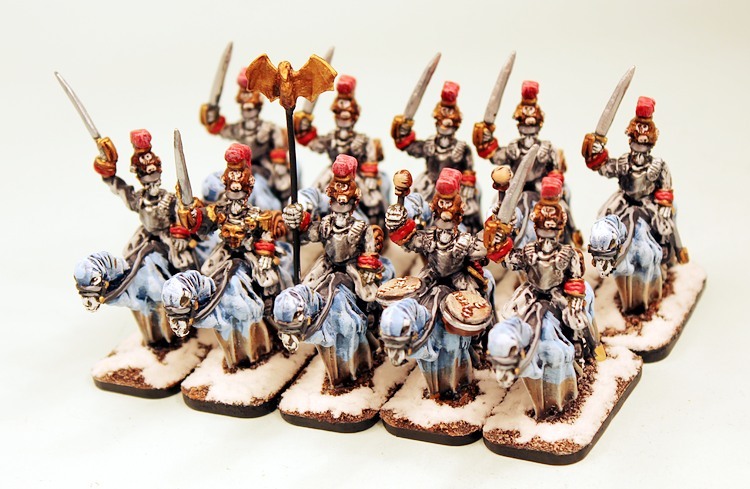 Spektrov Cuirassiers for Flintloque take to the frozen field! 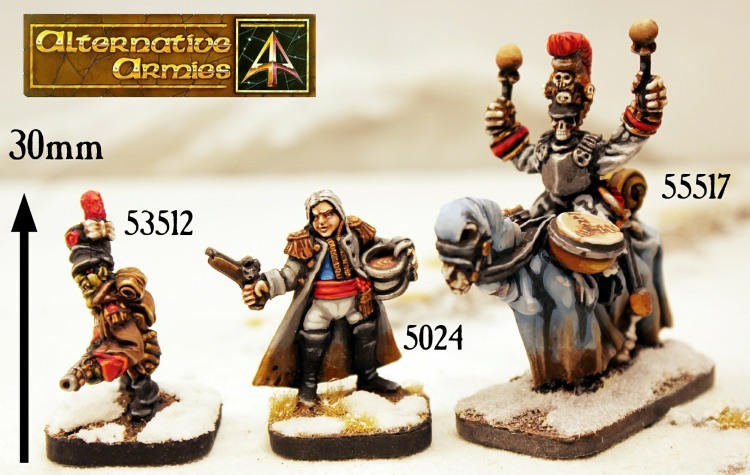 We promised a full unit release for Flintloque and Slaughterloo this month and following up on the new Grand Howitzers and the Dead Rams we have for you the heavy hitters of the Dark Czar's Undead Army. 55517 Spektrov Curiassiers are here with re-mastered white metal riders and a new resin zombie horse as well as a reduced price. Also extra savings on taking a whole unit of ten. Go HERE to see them or read on for more information and a look at this new horse. 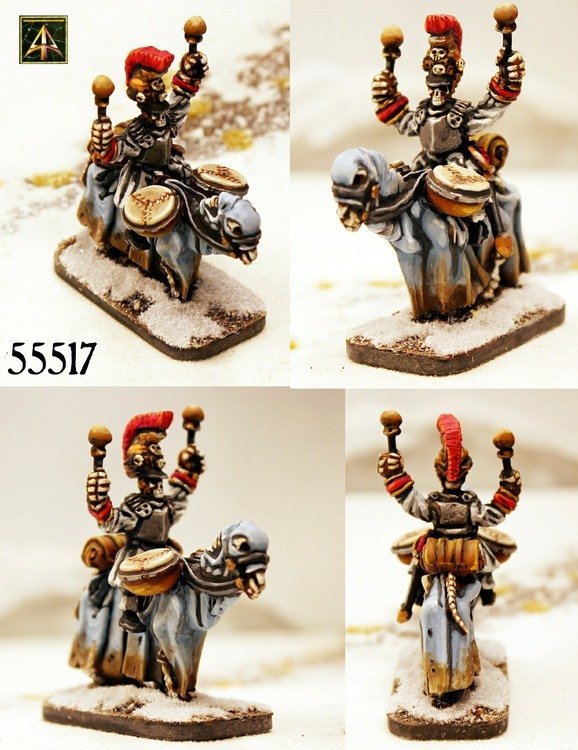 Not encountered during the endless march towards Moskova by the Elves these riders are the heavy hitters of the Undead cavalry and for the deceased they are of an excellent quality. Carrying long straight swords and wearing a lot of iron armour these soulless killers can be found at every major battle, leaving the routine hunting of stragglers to the Zombiski Cossacks and others of less value. Unless they feel personal vengeance is merited. Savant Zombies acting alone the Cuirassiers wear loose grey and or white cloth breeches and shirts with black or polished metal cuirass and helmet with red horsehair crescent plume. Facings are red or green and metal work is gold. Zombie Horses have brown saddles and light blue horse blankets with a gold and red blanket roll. From 5026 Death in the Snow. Optional Flintloque Rule: As they wear a Cuirass you may optionally add a +1 to the riders Steady rating against ranged fire only. This code contains five different 28mm scale skeletal riders in armour with plume topped helmets as well as five resin horses. The riders are an officer with sword raised, a sergeant with sword forward (separate arm), standard bearer with bat topped pole (separate top), musician with two kettle drums and arms raised, trooper with sword at the ready. Horses come with a separate saddle roll plus one will have the kettle drums too. Easy to assemble and sculpted by Steve Young (riders) and Sam Croes (horse) you can choose from a pack of five or a unit of ten or a single trooper booster. There is a saving for the pack over the single and the unit over the pack. You may also choose to purchase these miniatures painted and based ready for play from here in Scotland. These miniatures come supplied with our resin cartouche cavalry bases. Select your option on the page. 18.00GBP (was 24GBP) per pack of five. Go HERE. Those of you who are long term collectors of our miniatures will recognise these skeletal riders as those of the Undead Curiassiers and you are correct; they are. Let me tell you a bit more about what we are doing with the Curiassiers and the new horse too. As you will know Alternative Armies has been converting many of the riding beasts used in Flintloque and Slaughterloo from white metal into resin. Dogman Horses, Orc Horses, Camels, Rhinos, Moose and others. This was done for several reasons the one ones being a reducing in price to you the customer for the large units you like to collect due to this new medium. Some other projects are on the go too and one of these was a new horse for the heavier Undead cavalry. 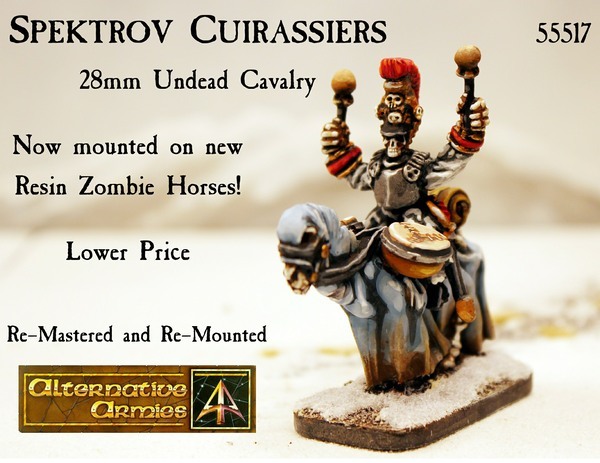 The first of these are the now Spektrov Cuirassiers which have had their price reduced overall with this new resin zombie horse over the original white metal one. 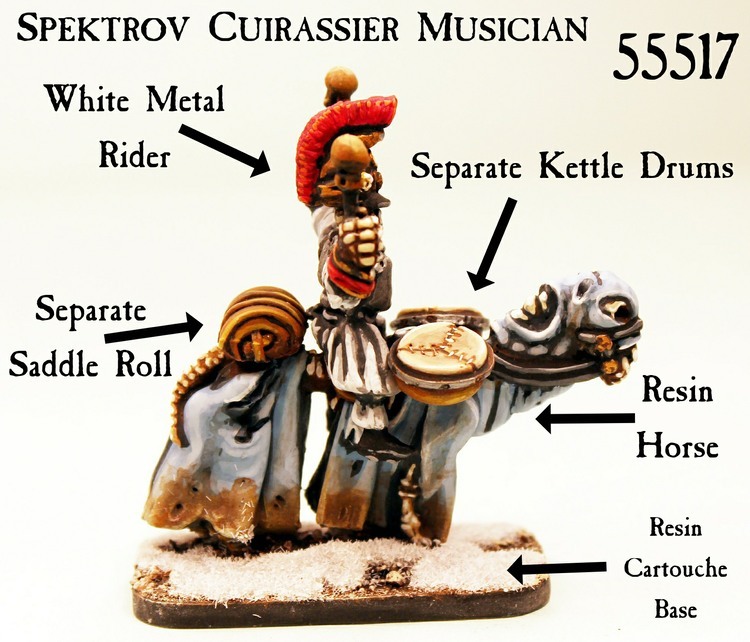 This new horse has mounting places for accessories and comes with a saddle bag (you can mount this on the horse or on a rider or foot miniature too) and musicians get kettle drums. This is shown in the picture above. Steve's riders were re-mastered to fit the new horse and here we are. I am sure you will agree that the new horse is really nice. It can be used for Valon and for High Fantasy too which will occur in our future releases. It will feature again for personalities and for an expansion to 5024 Escape the Dark Czar...after all the Savant Zombies in the beginners box are dismounted cavalry. More on this nearer the time. Here is a picture of the Spektrov Curiassier musician next to General Saindoux and a Goblin private of the Al-Garvey Legion giving you the relative sizes of each with 30mm being the height from the bottom of the base to top of plume of the Goblin. You can see all of these miniatures on our Begin in Flintloque page. There are also free scenarios there to download. This is our last release for Flintloque this month. See you in March with more awesome for the best black powder fantasy tabletop games in the world as well as more free articles and content too.